Dark Rustic Tones - Lightroom2 Preset, originally uploaded by SkeletalMess. 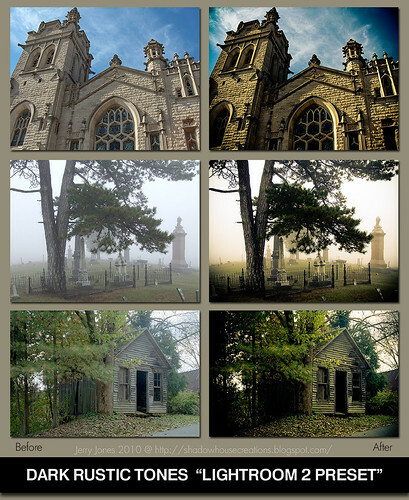 Another free Lightroom 2 preset. Sorry about the link, it's fixed and ready. Oh, a nice one. Thank you. Love the depth of colors. Thank you so much for sharing! Thank you so much for this Freebie. I want to let you know that I posted a link to your blog in CBH Digital Scrapbooking Freebies, under the Page 9 post on Feb. 02, 2010. Thanks again. This is a very fine preset. Recently took some pics in a cemetary and boy oh boy, did this preset make those pics shine. Thank you so much for sharing all your beautiful textures, presets, and everything else. Jerry I can not thank you enough for all the textures and presets. Jerry, I just loaded this preset and must say how wonderful it is! I have used Photoshop mainly for anything creative and Lightroom to just adjust the image to start. I AM IMPRESSED! Thank you for sharing. Thanks for the wonderful presets! Thank you for these gorgeous presets Jerry, your generosity is very much appreciated!